Or is it just faster to ask where can we not find community? As social beings, we yearn for companionship. In an age of instant communication, we can discover community in places heretofore improbable, if not impossible. Are online relationships preferable to those face-to-face interactions? Of course not. But with our ever-expanding social networks erasing miles, time zones, etc., it isn’t possible to have IRL (in real life) contact with each and every person. The internet has the ability to protect connections that in earlier times would have been severed out of necessity. I remember MamaBear, z”l, telling me that she knew nothing about her grandparents. When her parents came to America, they said good-bye to more than an environment hostile to Jews. They left knowing that they would never again see their parents in this lifetime. As one of my RWB colleagues concluded in yesterday’s session on Technology and Community, that with the exception of death, there is no reason to say good bye. There is an expectation of ongoing connection. Much time is spent decrying the potentially destructive effects of social media. Let’s not overlook the constructive ways in which sacred connections are strengthened. 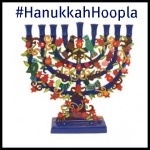 It is time for #HanukkahHoopla!!! Head on over to Leah’s Thoughts and Ima on (and off) the Bima for Day #1. Very nice post and great reminder to remember the human relationships! As someone who moved halfway across the world from her family, I actually do think of this often. I can’t even imagine what earlier generations went through, knowing that that goodbye was final, that even letters, if they got through at all, would be months out of date. The very idea breaks my heart. Say what you will about social media, it’s also done an awful lot of good. woo-hoo! Hanukkah Hoopla! This is my first link up by the way. Can you believe it!? It is a wonderful thing about the Internet — that ability to stay connected is amazing — but it is important to disconnect, too — lest we become slaves to it. I am grateful for Twitter because without it, I would never have found you. And in finding you (and the others), my thinking has been re-framed in terms of my audience. Sometimes I find myself censoring myself. I don’t like that, but I have a large evangelical following and I have worried about offending them. I had an epiphany during this whole #HanukkahHookup thing that is bigger than candles and dreidels and oil. I have been hooked into a network of people who don’t really accept me. They are nice and all, but they are waiting for me to accept Christ. They pray for me. (For real, I can point you to a post where they are having a pray-in for me.) I thought that was nice for a while. Now, not so much. Just today, I stopped subscribing to a lot of those blogs and am now subscribed to people’s blogs where I feel a greater sense of a community where I feel my worldview is better reflected. This is not to say I am isolating myself from the rest of the world, but I have a clearer idea of myself and for whom I really want to write.